Thursday, August 6, 2015 – “I remember seeing ‘Alice in Wonderland’ when I was in fourth grade, crying and saying to myself ‘I want to do that.’” Since then, Randy James has become a dance professor at Rutgers Univeristy, founder and artistic director of dance company 10 Hairy Legs, and now, choreographer in residence at Socrates Sculpture Park for Dance at Socrates, a program in collaboration with arts organization Norte Maar. The dance residency and performance program, which is now in its third season at the park, invites New York-based choreographers and dancers to create or further develop a new work. 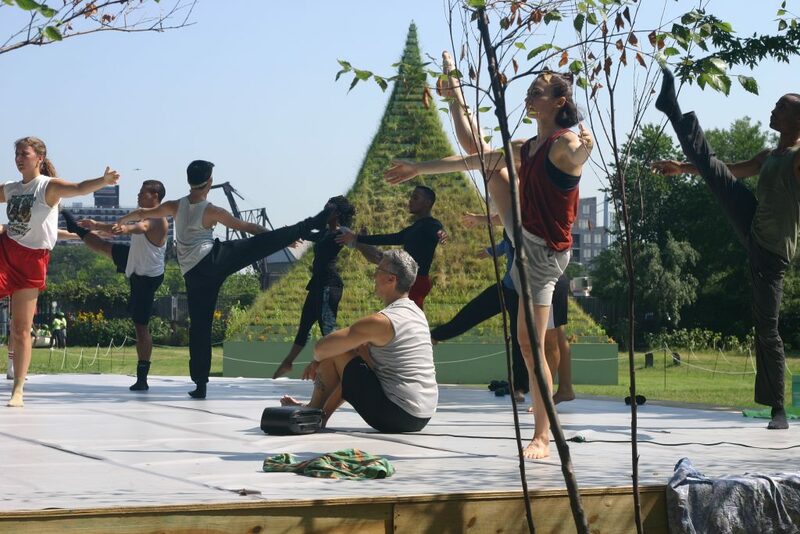 Each week, a different choreographer rehearses on site and in public with dancers, culminating in a Saturday performance of the piece. Randy James inaugurated the season by kicking off his weeklong residency on Monday. James started the all-male dance company 10 Hairy Legs in 2012, and five weeks ago, began an offshoot branch that he now calls 10HL Projects. This developing aspect of his company welcomes both men and women into its programs. This Saturday, 10HL Projects will be performing a full-length preview of James’s “The Lion, The Witch, and The Wardrobe,” set to Mozart. James debuted the same project in 1998, but this rendition is composed of an entirely new set of choreography. “I’m a different person now,” James says. Much like James’s childhood realization during ‘Alice in Wonderland,’ the 1998 performance of “The Lion, The Witch, and The Wardrobe,” inspired another young child to pursue dancing. “Monica saw this piece when she was eight,” James shares, pointing to a young woman at the far end of the stage. “Now she’s dancing the lead role of Lucy, the youngest of the siblings in the story.” The book The Lion The Witch and the Wardrobe, by C.S. Lewis, tells the tale of four young children who venture into Narnia, a world of myth and magic. In Narnia, Lucy befriends Mr. Tumnus, a fawn who has been captured by the story’s antagonist, the White Witch.